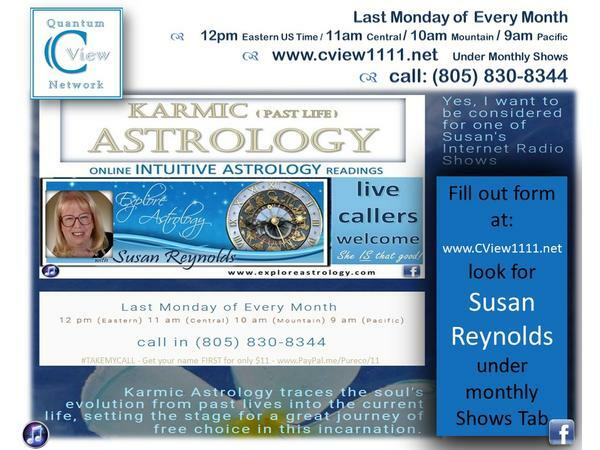 C View Quantum Network welcomes host, Susan Reynolds with her monthly show "Karmic Astrology". Each month Susan brings pertinent information about the stars, planets and our zodiac signs. She answers calls from the general public and does mini-astrological-readings from 3 people who have sent in advanced their natal information. She loves Astrology and you'll see why, Join Producer, Claudia Pureco in welcoming our BRIGHT STAR! Susan Reynolds has worked as a karmic astrologer for the last 30 years. Karmic astrology looks at your soul's journey. What were your past lives and how do those lives impact your current one? Astrology helps us learn the easy way and avoid potential pitfalls. It is the only modality that is able to look at your past, present and future and it's my pleasure to read for you and offer you its insight and help.